During the summer months, finding entertainment becomes a top priority. For that very reason, All in Fun is providing party packages to help create memorable summer experiences for any event you have on the horizon. With the weather heating up, inflatables from All in Fun are a great commodity to have that any guest would be happy to put to use. Remember, at All in Fun we provide more than just inflatables. If you have a party on the horizon, we can provide magicians, clowns, fortune tellers and DJs. Don’t hesitate to reach out to All in Fun to make your event one to remember. There are a number of specials being offered to help make summer fun affordable. Below you can find more information on the promotions being offered by All in Fun this summer. Obstacle courses are a phenomenal way for kids at a birthday party to get exercise and to bond with friends. For those very reasons, we are offering $20.00 off of any obstacle course rental through August 15th! All you have to do is mention “FACEBOOK” to receive the discount. The designs of the obstacle courses provide shade from the summer sun while allowing kids to enjoy the experience of sharing an inflatable with friends. The July party package offered from July 1 to July 11th is designed to provide party goers with multiple entertainment options at a party for one low cost. The entertainment options include large bounce houses, inflatable carnival games, bubble machines, ring toss and more. The offer remains valid while supplies last. This is an amazing option for anyone seeking to create a memorable party on a modest budget. Instead of having to find and supply all of the entertainment yourself, reach out to All in Fun at your earliest convenience to find out about how our party professionals make your party unforgettable. One popular way to keep cool throughout the summer months is to enjoy one of our popular new water slides! The water slides contain a small splash pool at the end of the ride. If you’re planning on having a party or get together for kids, a tropical luau themed water slide is a great option. As with all of our inflatables & obstacle courses there are flexible delivery and pick-up options. If you’re considering refreshing, new ways to entertain kids at a summer party considering an inflatable water slide is a great idea. Don’t miss out on your opportunity to provide meaningful summer memories using the equipment offered by All in Fun. 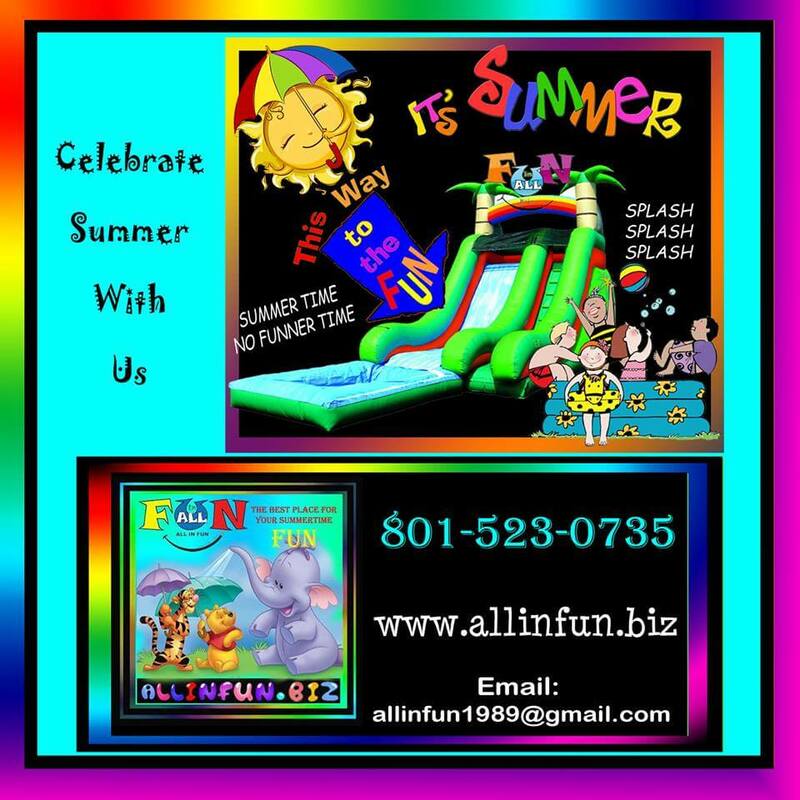 All in Fun is capable of providing more than simply bounce house rentals in Salt Lake City. All in Fun provides an entire party experience. If you’re looking for versatile party entertainers in Salt Lake City, don’t hesitate to get in contact with the professionals here at your earliest convenience. Water slide rentals in Salt Lake City are a hot commodity during the summer months. Secure yours for your next summer event with All in Fun today! Are You Ready to SPRING Into Action With Clowns, Magicians, and Face Painters?